JUNE 9 ~ NATIVE NEW YEAR CLAMBAKE ~ 11 a.m. The traditional clambake holds important spiritual and cultural meaning for Native people. To celebrate the 2018 season, Chef Sherry Pocknett and Traditional Bakemaster Vernon Pocknett will be serving an eastern woodland clambake prepared in the Native tradition of using hot stones and rockweed to steam lobster, fish, steamers, linguica, hot dog, corn on the cob, white potato, sweet potato, onion and brown bread. There will also be chowder prepared with locally sourced quahogs, and watermelon to end the feast on a sweet note. The preparation alone is a sight to see. A single clambake will include one of each of the items mentioned above. For those of you with children, this is an abundance of food and two little ones can easily share one clambake. Visitors can learn the process and technique involved in creating a clambake: how to select and arrange the stones that will create the "rockweed oven", the purpose and importance of the rockweed, and the art of placing food on the stones so that it all cooks evenly. Traditional singing and exhibition dancing are also part of the celebration. Entertainment begins at 11 a.m. and the clambake will be served at 1 p.m. Tickets are $75 for members; and $85 for nonmembers. The Mashantucket Pequot Museum & Research Center is located at 110 Pequot Trail, Mashantucket. For more information, visit pequotmuseum.org or call 800-411-0671. JULY 4 ~ FOURTH OF JULY CLAMBAKE ~ 6:30 p.m.
A traditional New England Clambake sets the scene for the celebration of our nation’s birth at the Weekapaug Inn in Westerly, R.I. "Weekapaug," a Native American word meaning "end of pond," accurately describes the positioning of the Weekapaug Inn at the edge of two large saltwater ponds — the Winnapaug and the Quonochontaug — which dominate the map of this coastal area. An extensive selection of clambake fare, refreshing beverages and scrumptious s’mores make this family-style event a patriotic affair to remember. Visit WeekapaugInn.com/events for details. Dinner will be served from 6:30 to 8:00 p.m.; tickets are $105 per adult, and $50 per child. The inn is located at 25 Spray Rock Road. Call 401-637-7600 for more information. The inn will also host THURSDAY NIGHT CLAMBAKES from July 12 through Aug. 30 at 6 p.m. Clambake fare is served family-style. After dinner, gather at the ﬁre pit on the Lawn for s’mores under the stars. Tickets are $85 per adult and $40 per child (plus tax and gratuity). 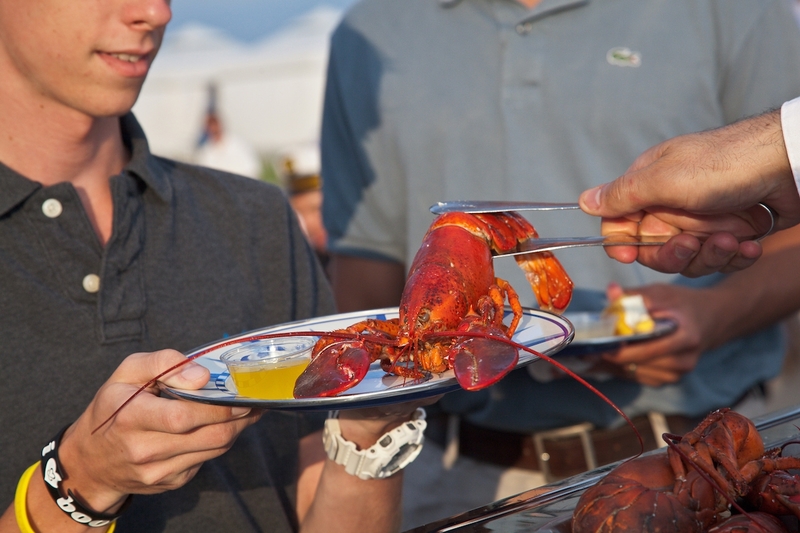 On Monday nights, and select Friday nights, throughout the summer, experience a traditional New England Lobster Boil with creative barbecue options held on the private beach at the historical Ocean House Resort. The events feature live music and family-style seating. Tickets are $110 per adult and $55 per child (plus tax and gratuity), beer and wine included. New England Lobster Boils are planned for July 6, 9, 16, 23, 27 and 30; and August 3, 6, 10, 13, 20, 24 and 27. The historical Ocean House is perched high on the bluffs of Watch Hill, R.I. Visit oceanhouseri.com for more information. Flander’s Fish Market offers a unique take on the traditional clambake for singles, couples and small parties. Known for its fresh food store, restaurant and catering services, Flander’s also serves up clambakes for one. For $45, you get clear or New England-style chowder, steamers, mussels, a 1¼-lb. lobster, grilled New York strip steak, barbecued chicken breast, corn on the cob, seasonal red potatoes, and cole slaw or potato salad. All of this goodness to go is available at 22 Chesterfield Road, East Lyme, CT. Delivery service is an option for larger parties. Visit flandersfish.com for more information or call 860-739-8866 to place an order. The Place Restaurant at 901 Boston Post Road in Guilford offers an unusual experience in outdoor dining about 45 minutes from Mystic. You won’t find chairs (they use tree stumps), but you will find that the “kitchen” consists of a large fire pit with lobster, corn, steamers, fish, steak, chicken and more, roasted seven days a week May through September, weather permitting. Bring cash, and visit theplaceguilford.com for history on how it all began.